Positive operating results on crude mix optimization and improved benchmark refining margins. Significant reduction on financing costs and interim dividend distribution of € 0.15 per share. HELLENIC PETROLEUM Group announced third quarter and nine month financial results. 3Q17 Adjusted EBITDA at €206m (+8%) continued a series of strong quarters and 9M17 Adjusted EBITDA reached €663m (+28%), while 3Q17 Adjusted Net Income came in at €89m (+19%) and 9M17 Adjusted NI at €313m (+71%). The key drivers for the results were the good performance of Aspropyrgos and Thessaloniki refineries, which partly offset the negative impact of the Elefsina refinery maintenance shutdown, strong benchmark refining margins, lower cost of crude mix and increased sales in the domestic market. Sales in domestic as well as aviation & bunkering markets continued to grow by 16% and 14% respectively, with total Refining, Supply and Trading sales at 3.8m MT. All business units reported positive contribution. Domestic Marketing recorded improved profitability on account of higher sales, while international subsidiaries also reported improved performance. Adjusted EBITDA for Fuels Marketing business was €46m (+ 5%), while Petrochemicals maintained its Adjusted EBITDA at €24m. In terms of Reported IFRS results, the recovery in crude oil prices had a positive impact on inventory valuation, with 3Q17 IFRS Reported Net Income at €106m (+32%) and 9M17 NI at €273m (+ 49%). Financing costs continued to drop with 3Q17 reporting a 22% reduction on account of lower Gross Debt and interests rates; Gross Debt was €260m lower than last year, while Net Debt remained at similar levels. In light of the reported results, the financial position and full year outlook, the Board of Directors approved a distribution of €0.15 per share as interim dividend for 2017. Increased demand led to a recovery in crude oil prices. Brent averaged $52/bbl in 3Q17, higher than both 2Q17 ($51/bbl) and 3Q16 ($47/bbl). Reduced oil products supply, due to unplanned refining shutdowns in Europe and particularly in the US, led to stronger Med benchmark margins, at levels significantly higher than 3Q16. Med FCC benchmark margins averaged $7.1/ bbl (+ 56%), while Hydrocracking came in at $5.9/bbl (+47%). The Euro appreciated significantly vs the USD in 3Q17, averaging $1.17, the highest since 2014. Domestic fuels demand stood at 1.6m MT, flat vs last year, as transport fuels consumption remained unchanged. The marine & aviation market recorded a new significant increase in 3Q16, with bunkering demand improving by 14% and aviation by 9%, mainly due to tourism. Financial expenses in 3Q17 amounted to €40m, 22% lower than last year, following the latest bond issues and bank loan renegotiations for interest rate reduction. The Group has initiated the process of refinancing bank debt, due in 2018, with expected further positive impact on cost of funding and maturities’ extension. Operating cash flows (Adjusted EBITDA – Capex) amounted to €525m in 9M17, increased by 21% vs 9M16. Net Debt in 3Q17 maintained at €1.8bn, unchanged compared to previous quarters. The positive results and reduced market risk allow for a reduction in Gross Debt and cash reserves held for risk management and other considerations. In E&P, the scheduled exploration works at the Patraikos Gulf concession continue, whilst the Lease Agreement with the joint venture TOTAL - EDISON - HELLENIC PETROLEUM for offshore Block 2, west of Corfu was signed on 31 October. In the following weeks, the Greek Parliament is expected to ratify the Lease Agreements for offshore Block 2, as well as for onshore areas Arta-Preveza and North – West Peloponnese in order for the scheduled exploration program to begin. The sale process for 66% of DESFA, which includes Hellenic Petroleum’s indirect holding of 35% and 31% owned by the State, is in progress. The two international bidders that qualified to submit binding offers are currently in the due diligence phase. DEPA Group is included in the consolidated financial statements of ELPE, as investment in affiliated companies, with a net carrying value of €659m, while its participation in 9M17 results amounted to €47m, with DESFA significantly increasing its profitability. In addition, during 3Q17, the construction for 3 photovoltaic parks with total installed capacity of 8.6 MW was completed, with two of them already in operation, while the third is expected to start operating in the next days. The maintenance shut-down of Elefsina refinery affected total production and sales, that amounted to 3.4m (3.9 in 3Q16) and 3.9m (4.3 in 3Q16) MT respectively. 9M17 total sales came in at 12.1m MT (+3%). 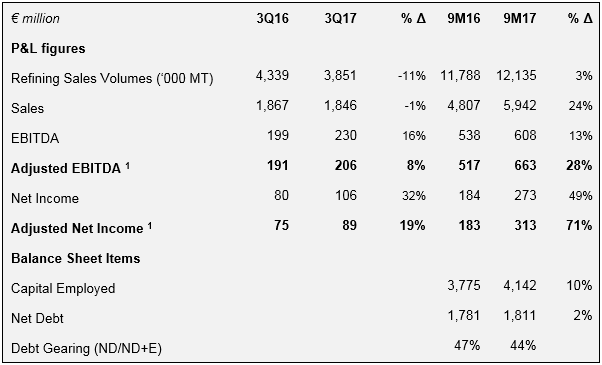 Flat PP benchmark margins and stronger EUR led to a small decline in Petchems operating profitability, with Adjusted EBITDA at €24m (-6%). Domestic Marketing sales continued increasing, with volumes of 1.2m MT in 3Q17 and Adjusted EBITDA at €27m (+5%). International Marketing recorded a small increase in operating profitability, despite weaker volumes, with 3Q17 Adjusted EBITDA at €19m (+6%). DEPA Group participation to consolidated Net Income came in at €12m, as DESFA’s increased profitability offset DEPA’s reduced contribution. The delay in re-establishing the flexibility remuneration mechanism for gas-fired units, affected Elpedison’s results for the quarter, with 3Q17 EBITDA at €2m.